This is a resource post, where you will find article links to explore more this weekend. In this post, I have shared topics written by experts from the fashion industry. 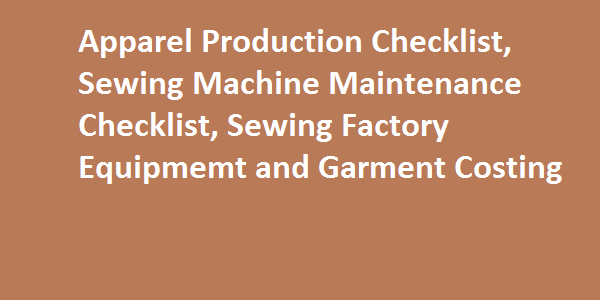 If you are looking for topics for reading on machine maintenance checklists, apparel production checklist, Costing tips for knits garments and sewing factory equipment, keep reading. To read more on each topic click on the links. From concept to consumer acceptance of your apparel products you need to do many things to make your business successful. Frances Harder, author of the book 'Fashion for Profit' has mentioned 33 steps check list that would be helpful for entrepreneurs. Many Retail, Brand-name Marketing, Mail Order and Sourcing Companies are visiting existing and potential Contractor sewing facilities and evaluating their sewing capabilities for producing quality products for their customers. In many cases they even rate the vendor and give the plant a grade based on their observations during their visit. Generally one area that is evaluated is the sewing floor and the condition of the sewing equipment. Before we look at the Checklist on the following pages, let us look at the many factors affected by poor sewability and they include. Garment costing is always an interesting topic among merchandisers and entrepreneurs. If you know better costing procedure, it can help you to improve your performance. Number of equipment are required to process garment from cutting room to finishing processes. Machine and equipment manufacturing company Ngai Shing has developed many useful equipment for the garment industry. Following the link you would get name and equipment images those are commonly used by garment manufacturers across the globe. If you have read some good article(s) in the recent past, you are welcome to share those topics with us. Read apparel production checklist, sewing machine maintenance checklist, sewing factory equipment and garment costing.